Detroit motor show is starting after one week on January 14 to January 21 2012. It is featuring the latest cars and automotive technology that will be introduced in 2012. The new sales drop down significantly in 2011 and automotive experts are looking at the Detroit motor show. 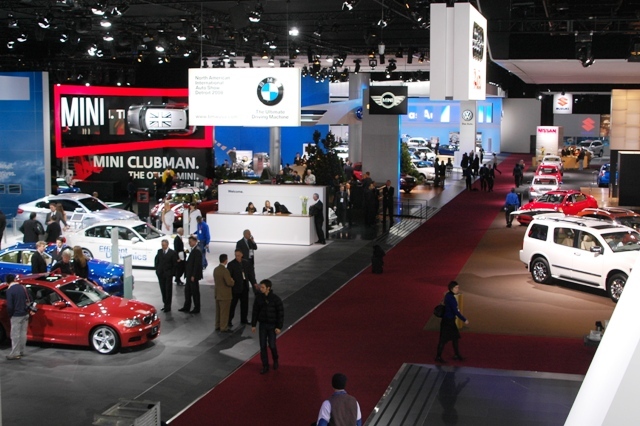 It is one of the biggest trade shows of the automotive industry and how it will help companies to increase the sale. We’ll cover the Detroit motor show and cover some of the highlights of the cars. Acura will be debuting its first ever hybrid car in the show the successor of Honda NSX the Acura ILX Concept. It is based on the Honda Civic and RDX concept. Audi’s favourite A4 will receive some changes that will be exhibited in Detroit motor show to compete with BMW 3 series. The new SUV concept will be introduced by Audi. Bentley will be demonstrating its technological advancements featuring Continental GT V8 and Convertible GTC V8. Good news for sports lovers that they might be introducing a new powerful engine. BMW will be exhibiting their favourite BMW 3 Series, the most refined car in the class. It will remain the eye-candy for the executive segment. The Buick Encore SUV will be featured that will be manufactured in UK. Different variants will be introduced at the year end when available for sale. Cadillac is focusing on ATS as they think it will target German car manufacturers. It might be an attention grabber for executive class segment. Chevrolet Sonic RS will debut, but it is not confirmed for UK market. It might be introduced later with a different name. Dodge will be featuring Dodge Dart and Dodge Charger Redline. It will be featuring latest technology and developments. Ford Fusion will be debuting, and it is the most hyped version of Ford. It will be introduced with the name Ford Mondeo in European markets. However, it will be available for sale in late 2013 or 2014. Honda Accord coupe will end, and the new saloon Accord will be in line for production. Hyundai will continue its aggressive manufacturing and developments with Veloster Turbo and Genesis Coupe. Hyundai Veloster would be the hottest talk of the motor show. Lexus is thinking to go into production with LF-LC a coupe. It is based on LFA super car and share many design elements. Ford is investing heavily in Lincoln, there will be facelifts of models MKZ Saloon Concept, MKS Saloon and MKT crossover. Mercedes SL will be debuting that will be available for sale next July. Mercedes will be joining hybrid revolution with E300 BlueTec diesel-electric saloon. Mini will be exhibiting Roadster the sister car to Coupe. Nissan will be introducing new lines to Pathfinder SUV. Furthermore, NV200 electric version will debut. Porsche cabriolet 911 will be having new changes that will increase performance. Smart will be introducing For-Us concept to increase its production line, but no news on when it will be started. The NS4 the hybrid concept will be featured alongside Toyota Prius C.
VW recently launched Touareg hybrid and Jetta is next in line to be converted to hybrid. Volvo XC60 Plug-in is the news from Volvo, which has received appreciation from automotive critiques.